Improve traffic safety warning, to avoid rear-end accident. When driving clogged at night, continued brakes produce visual fatigue,This flasher can solve this shortcoming very well. 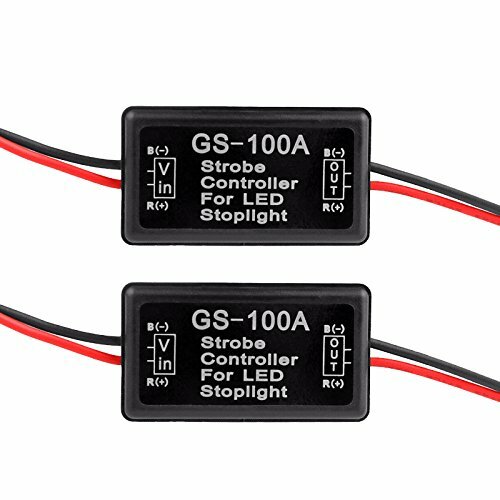 This small block controller enhance your brake light function with 2 patterns,when braking: 1. fast-blinking 4 times , 2. slow-blinking 4 times, When flashing is completed, stay in the original steady light. Wide boltage 12V - 24V DC , suitable for all motor vehicles, cars motorcycle tank armored vehicles electric bicycle and other LED lights, the best installed in the third brake lights. 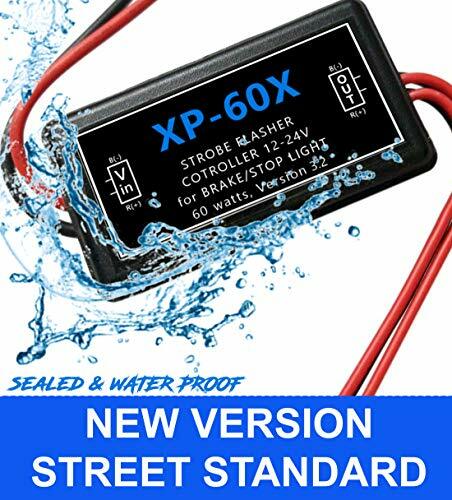 Complete sealed technology make it waterproof, short circuit prection. 5. 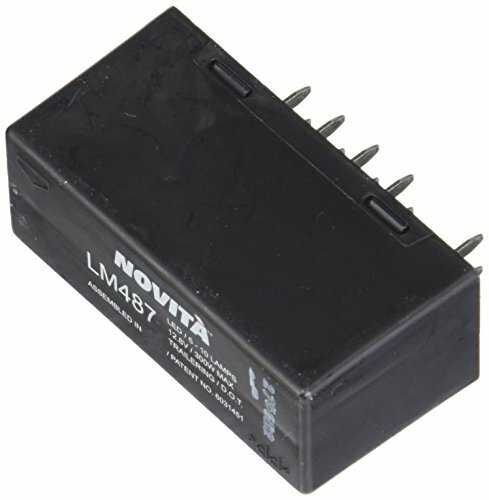 Suitable for: All cars with 12V. Improve traffic safety warning, to avoid rear-end accident. When driving clogged at night, continued brakes produce visual fatigue,FXC flasher can solve this shortcoming very well. This small block controller enhance your brake light function with 2 patterns,when braking: 1. fast-blinking 4 times , 2. slow-blinking 4 times, When flashing is completed, stay in the original steady light, This warns your following drivers with a catchy blinking light. Easy to install and durable.With our strict quality control system, we test each item and 100% ensure in good condition before we ship.Enjoy 1 year quality warranty under regular use. Offering customer technical service, feel free contact us for technical, installation and use question. 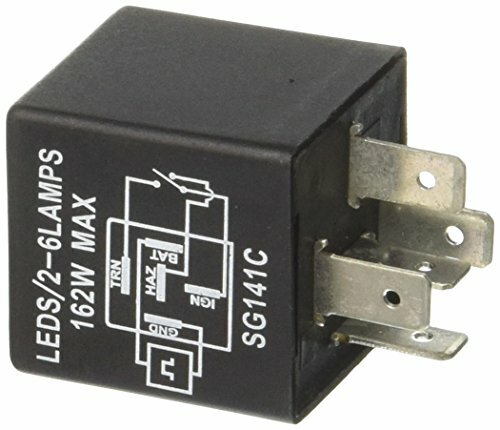 The LED flasher does not replace all flasher relay. Before ordering, please make sure the 3-pin configuration is the same as your vehicle's. You can usually find your flasher pin out printed right on your flasher. Failure to check this and installation in an incompatible vehicle can blow your fuse, destroy the flasher and void the flasher warranty. 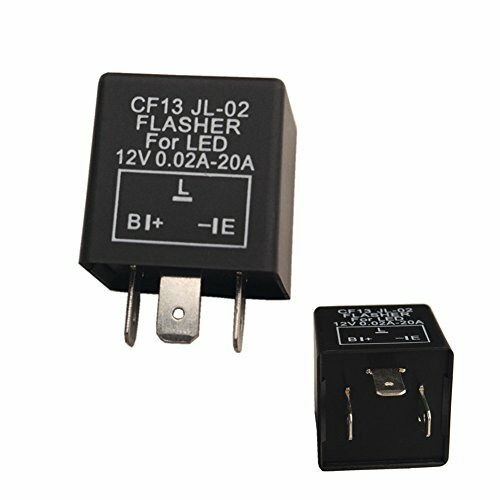 CF13 features for a piece of 3-pin Electronic LED 12V Flasher Relay Fix for Turn Signal, Blinker Light. This will solve LED related turn signal problems such as rapid flashing, not flashing, or bulb burnt out warning on dashboard. These are designed for most 3-pin Japanese configurations. Simple Plug N' Play. 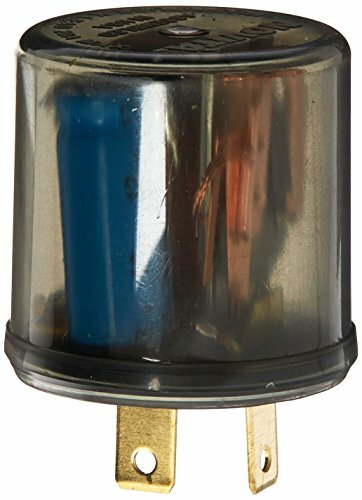 Round, 2-Prong Electronic Flasher, replaces 552 or 536 flasher in most applications. 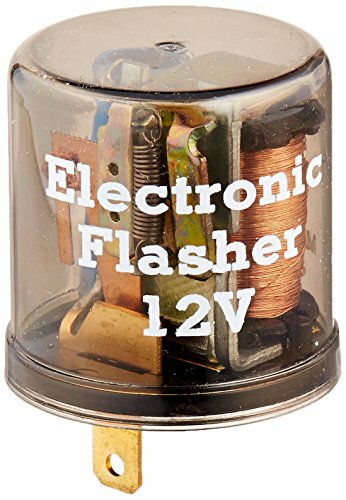 Since the timing is electronically controlled, this flasher will flash at a constant rate, rather than depending on the load. For use with incandescent (regular) bulbs. 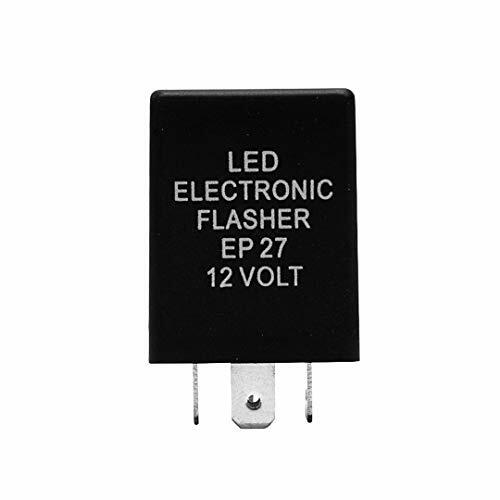 If you need an LED-compatible flasher, please use model EF32RLNP instead. 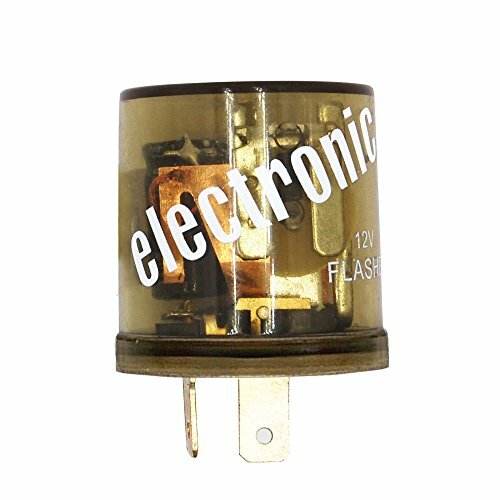 Electronic LED Flasher Relay will solve LED related turn signal problems such as rapid flashing, not flashing, or bulb burnt out warning on dashboard. 12V heavy duty 2 pin electronic signal flasher (blinker) relay that is a plug and play design. Maybe a resistor are required to use for the LED bulbs. 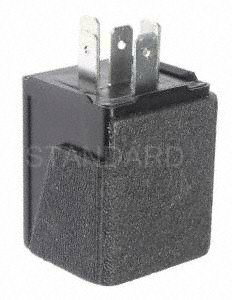 Uniserval flasher relay fit for many vehicles (1956-2002) that use a 2-prong (2PIN) flasher with a socket wired to SAE specifications.Fixed blinker speed and great for led tail lights. Hazard warning flasher and turn signal flasher. 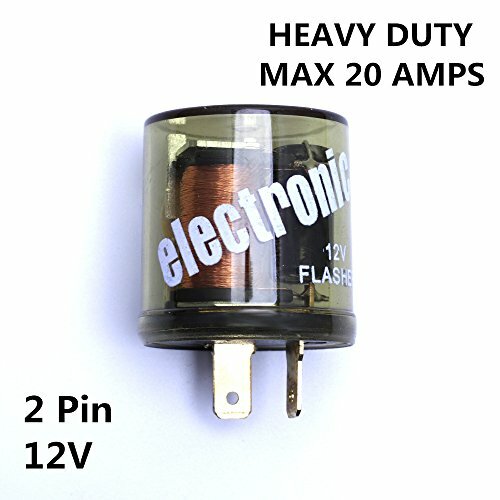 MAX 20 AMPS & Voltage: 11-15 volts. 24 months warranty and lifetime friendly service,if any product problem please contact with us. 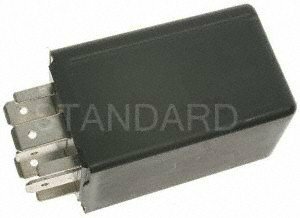 ACDelco GM Original Equipment Hazard Warning and Turn Signal Flasher is a GM-recommended replacement component for one or more of the following vehicle systems: body-electrical and lighting. 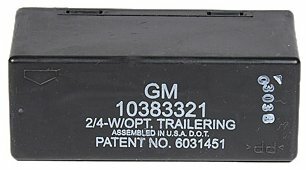 This original equipment flasher will provide the same performance, durability, and service life you expect from General Motors. The FASTEST DEDICATED LED Brake Strobe Flasher Is Now Available On Amazon! 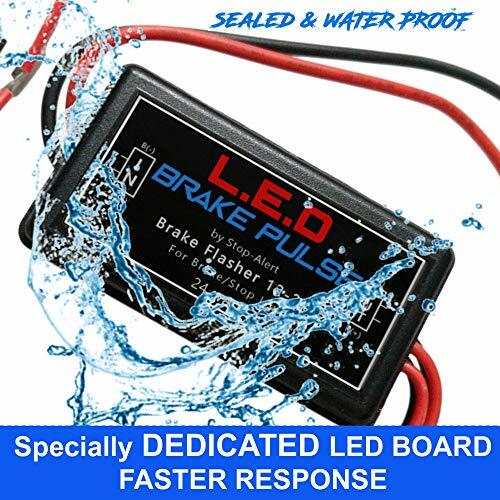 Brake Pulse is the fastest brake flasher model in the industry, works on most cars, trucks, and motorcycles. The FastFlash X brake flasher pattern promises to help you be safe at all times. It Prevent Rear-End Collision and May Save Your Life! Plus it looks great and adds up to the style and safety of your vehicle. Fast, Fast, it is extremely FAST! This groundbreaking automotive accessory is extremely durable and it features a long-lasting, waterproof construction. You buy once, you enjoy for life! It is very easy to install. Stop-Alert promises to always put customers satisfaction priority next to quality products. Providing you with the friendliest customer service is our number one goal. This is why we offer you a 3M installation adhesive tape that will keep the flasher in place and make the installation process very easy. The Brake Pulse X brake flasher is the best choice for those of you who wish to give your car, truck or motorcycle an added style and visibility. Whether you own a car or a pick-up truck a Dodge Ram, Ford F-150, Chrysler or Chevy Silverado don t miss out! XP- 60X is the most reliable brake flasher model in the industry, works on most cars, trucks and motorcycles. The XP- 60X brake flasher pattern promises to help you be safe at all times. It Prevent Rear-End Collision and May Save Your Life! Plus it look great and add up to the style and safety of your vehicle. Count on our proven years of excellent performance! This groundbreaking automotive accessory is extremely durable and it features a long lasting, waterproof construction. You buy once, you enjoy for life! It is very easy to install. Stop-Alert promises to always put customers satisfaction priority next to quality products. Providing you with the friendliest customer service is our number one goal. This is why we offer you a 3M installation adhesive tape that will keep the flasher in place and make the installation process very easy. The XP- 60X brake flasher is the best choice for those of you who wish to give your car, truck or motorcycle an added style and visibility. Whether you own a car or a pick-up truck a Dodge Ram, Ford F-150, Chrysler or Chevy Silverado don t missed out! What are you waiting for?Do Not Waste Time And Place Your Order Now While Supplies Still Last! 2016 Stop-Alert"
ADD STYLE TO YOUR RIDES: Elevate your vehicles LED Lighting Setup, Modern look & make It stand out! SECURITY IS OUR PRIORITY: Alert the back drivers of a sudden stop, Grab attention, Reduce accident. 2-Pin Motorcycle and Car Speed Adjustable LED Turn Signal Indicator Hyper Flasher Relay. This 2-pin Electronic LED Flasher is also speed adjustable. Universal fit for many vehicles that use a 2-Prong (2PIN) flasher with a socket wired to SAE specifications. Fit for Harley Davidson,Honda,Kawasaki,KTM,Suzuki,Yamaha and many other brands as well. You can use a flat head screw driver to adjust the knob on the bottom to set its flashing speeds from 50c/m to 200c/m . EASY to install the LED bulbs for the car and motorcycle for turn signal lights without having to cut the wires to install the load resistors, completely eliminate the LED rapid flashing problems. Using advanced SMD chip technology,with automatic short circuit protection, automatic overload protection, reverse polarity protection automatically.Allow more stable LED work. 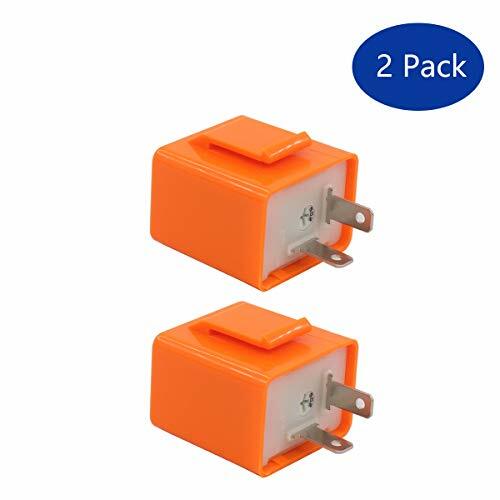 1.If the flashing speed is not up to the individual requirements , flicker frequency can be adjusted to achieve the speed of requirement by adjusting the switch on the relay 2 pins flasher relay, can be fitted on most of motorcycle and car or any custom application . 2.Great for replacing a bad relay or correcting led turn signal problems (fast Flashing, no flashing). 3.Replace the stock relay in the fuse box. Please check your owner manual to locate the flasher. Pin B is power in, and Pin L is the adjustable power out. PLUG AND PLAY,Work to replace Most Standard Factory 2-Pin Flasher. A MUST HAVE ITEM, If You Want Upgrading Stock Bulb or Bulb to LED or for Your Exist LED Tail Lamps of Turn Signal lights. SPEED ADJUSTABLE, Clockwise:SLOWER , Counter Clockwise: FASTER. Flashing Frequency: 50 times/min to 200 times/min. Used for MOST Automotive/Motorcycle/Bike to fix the LED Bulbs Related Turn Signal Light Hyper Flashing, not Function Properly issues. Vehicle Brake Light Flasher Module. Safety Flash Light Alert. Universal. For Motorcycles and Cars. Microprocessor based safety alert device. 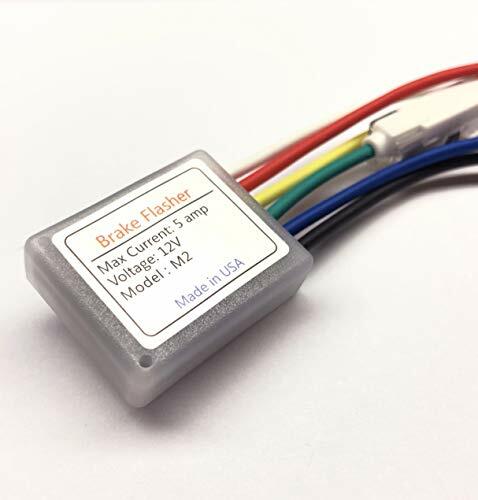 Flasher connects to existing third brake light and generates light flashing affect to alert those behind you when the brakes are activated. Number of flasher, rate , mode and other parameters are controlled and configured by user. Installation: Simple, three wires to connect. 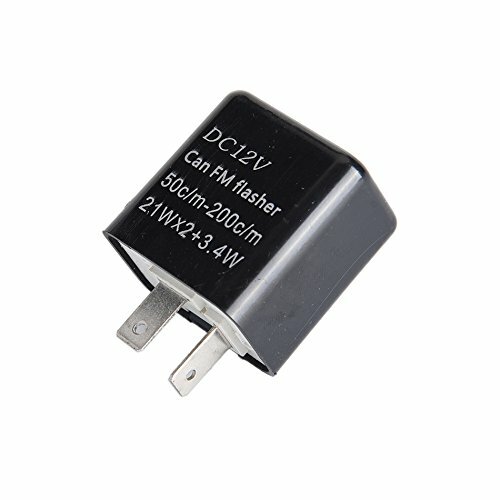 How to change modes: Flasher has two white control wires. By shorting the wires and following instruction you will configure all the flasher parameters which then will be stored in internal flash memory. One time set and forget. No other flashers on the market has more functionality, smaller package. Multi mode flasher, user configurable. Works on both LED and INCANDESCENT brake lights. Rated upto 60 watt (5 amp). BRAKE LIGHT - Flasher connects to existing third brake light and generates light flashing effect to alert those behind you when the brakes are activated. SAFETY FIRST - Microprocessor based safety alert device. Install today to prevent accident. SIMPLE INSTALLATION - Easy installation - just three wires to connect! 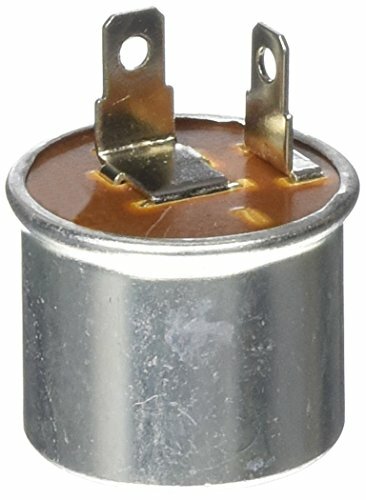 EASY FIT - Waterproof , miniature size circuit. Fits behind any brake light. MADE IN USA - Made in the United States. The FASTEST and most POWERFUL LED Brake Flasher Strobe for LED and INCANDESCENT bulbs Is Now Available On Amazon! 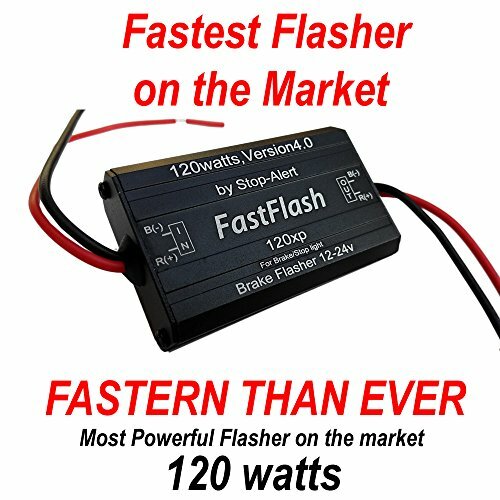 FastFlash 120XP is the fastest LED brake flasher model in the industry, works on most cars, trucks and motorcycles. The FastFlash 120 brake flasher pattern promises to help you be safe at all times. It Prevent Rear-End Collision and May Save Your Life! Plus it look great and add up to the style and safety of your vehicle. Stop-Alert promises to always put customers satisfaction priority next to quality products.Providing you with the friendliest customer service is our number one goal. This is why we offer you a 3M installation adhesive tape that will keep the flasher in place and make the installation process very easy. The FastFlash 120XP brake flasher is the best choice for those of you who wish to give your car, truck or motorcycle an added style and visibility. Whether you own a car or a pick-up truck a Dodge Ram, Ford F-150, Chrysler or Chevy Silverado don't missed out! ADD STYLE TO YOUR RIDES Elevate the look of your car truck or motorcycle, Make It stand out! Blazer FL552 / 536LL Long Life Electronic Flasher includes a standard 2-terminal variable load flasher. It is designed to replace the Blazer FL552 Thermal Flasher. 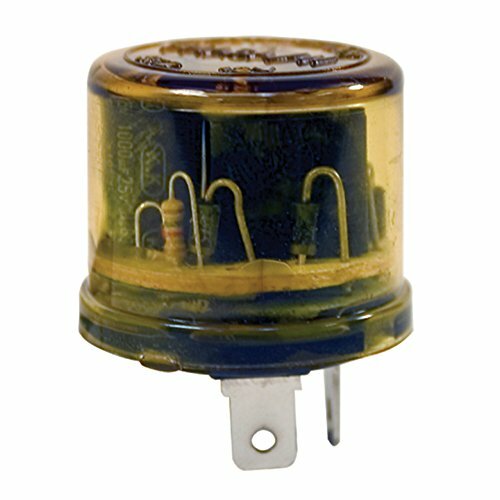 It is a standard 2 terminal variable load flasher designed for use on turn signal and hazard warning applications. This model offers triple the life of a thermal flasher. 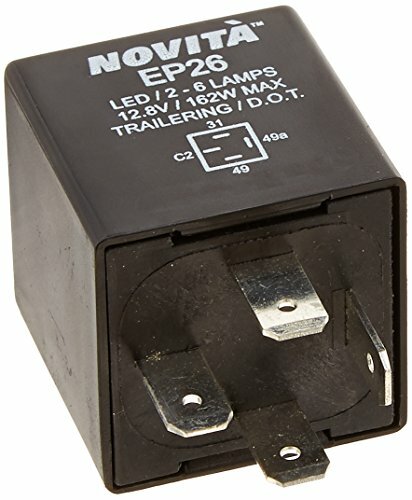 It fits all standard flasher receptacles and provides 60-120 flashes per minute. This flasher has a capacity of 1 to 6 lamps. It offers US FMVSS108, SAEJ590B, J945 ratings and conforms to Canadian CMVSS safety standards. Item includes the flasher only. Dash To Flash! Blazer carries a line of heavy-duty flashers for use on commercial vehicles, tractor-trailers, and emergency vehicles. Flashers are available in either thermal or electronic versions. They offer either a standard 60-120-Flashes per-minute or a selected electronically timed flash rate. Blazer is a recognized leader in the aftermarket lighting industry. Blazers product line contains products and accessories such as Stop / Tail / Turn Lamps, Marker Lights, Reflectors, License Lights, Replacement Lenses, Off-Road Lighting, Auxiliary Lighting, Safety Lighting, Portable Spotlights, Mounting and Wiring Accessories, and much more! Custom 5 Pin EP27 Flashers LED Electronic Turn Signal/Hazard Warn Hyper Flash Flasher Relay. 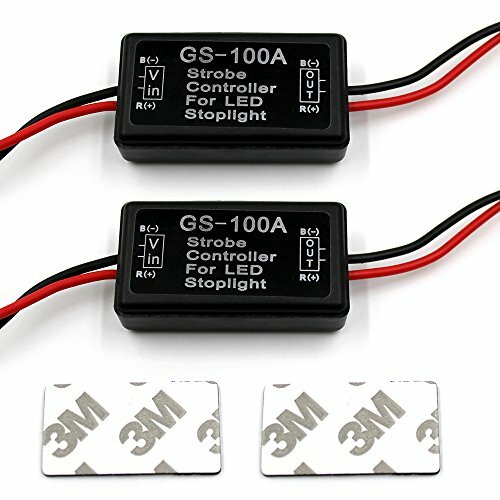 They are a MUST if you run LED lights to STOP the fast flashing or Hyper-Flashing . Please check the Models and Year before buy.Thank you. PLUG AND PLAY, Work to replace Most Factory 5-Pin Flasher. A MUST HAVE ITEM, If You Want Upgrading Stock Bulb or Bulb to LED or for Your Exist LED Tail Lamps of Turn Signal lights.??? Sub Type: Hazard Warning Flasher, Hazard Warning and Turn Signal Flasher. These flashers retain the reliability of an flasher along with staying extra cool, consuming very little power and extra long lasting life. The flasher will resolve the problem with hyper-flashing or no-flashing when you replace your stock incandescent bulbs with LED bulbs. CAUTION: Maybe a resistor are required to use for the LED bulbs. The following features set this item apart from other LED flashers. 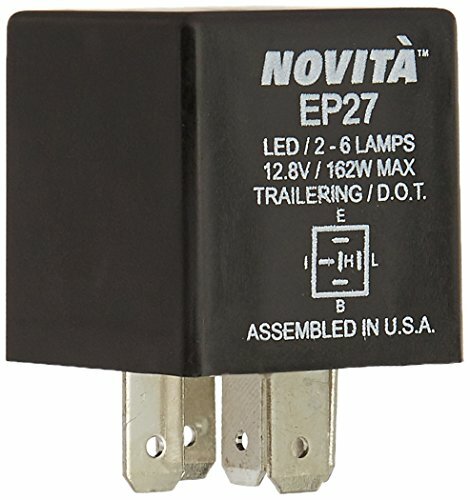 Works with LED bulbs AND regular bulbs, or a mix. Constant Flash Rate, regardless of the type or number of bulbs. This flasher is designed for vehicles that use a 2-prong flasher with a socket wired to SAE specifications. Some vehicles are not wired correctly at the flasher socket. If you are not sure, please review the images on how to determine how your socket is wired. It can fit for many cars and universal. Please review the specifications before buying. 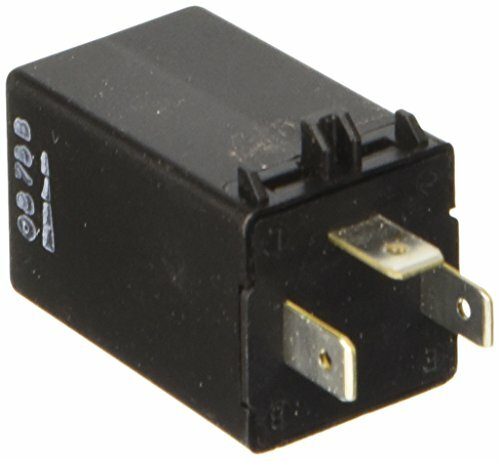 This is a heavy duty 2 PIN 12V electronic signal flasher (blinker) relay that is a plug and play design. Maybe a resistor are required to use for the LED bulbs. Fixed blinker speed and great for led tail lights.It can fit for many cars and universal. If you are upgrading to LED tail lamps of turn signal lights, this is a must have item. Local parts stores carry this product for around $16-$20. Buy it here and save money! It can solve problems like rapid flashing, no flashing,hyper flashing, or bulb burnt out warning on dashboard. It can solve problems like rapid flashing, not flashing,hyper flashing, or bulb burnt out warning on dashboard. It can solve LED related turn signal problems such as rapid flashing, not flashing,hyper flashing, or bulb burnt out warning on dashboard. 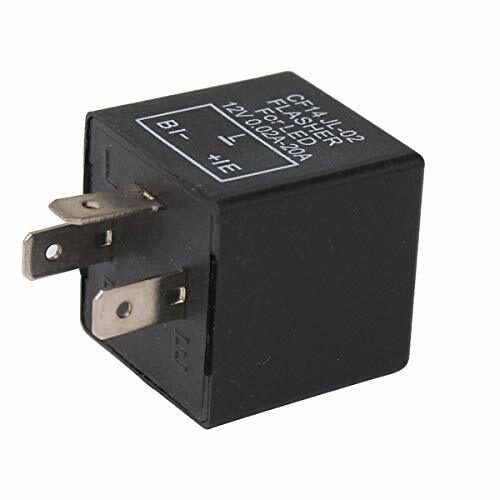 This flasher relay is different from conventional 3-pin LED flasher. With this product, the speed of this flasher is adjustable. This product can help to solve LED related turn signal problems such as rapid flashing, not flashing or bulb burnt out warning on dashboard. It can be applied to both ordinary light bulb and the LED lamp. And this item can be fitted on most of cars or motorcycles. Please allow 1-5mm error due to manual measurement. Thanks for your understanding. 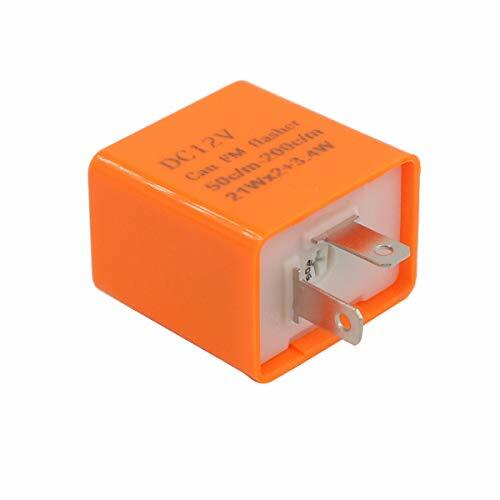 Universal The Flasher Relay can be applied to both ordinary light bulb and the LED lamp.This product can be fitted on most of cars or motorcycles. Used For Unlike the conventional 3-pin LED flasher, with this product, the flasher is speed adjustable. 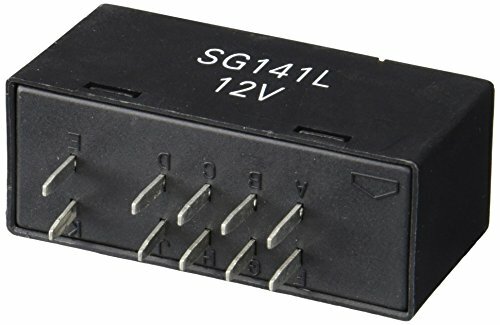 LED Electronic Flasher Relay Fix for the turn signal blinker ligh to fix hyper flash problems. 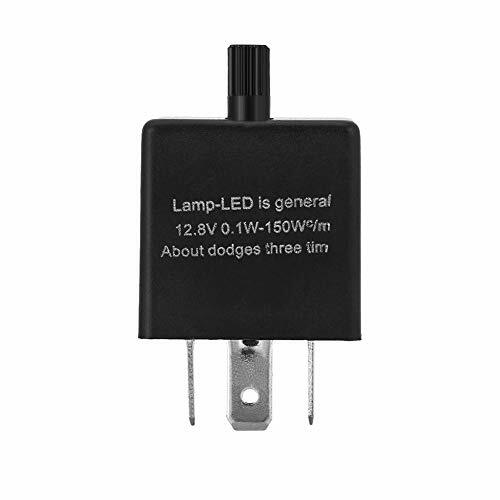 Solve Multiple Problems This product can help to solve LED related turn signal problems such as rapid flashing, not flashing or bulb burnt out warning on dashboard.And the Flashing Speed is Adjustable. Connection Instructions Replace the stock relay in the fuse box. 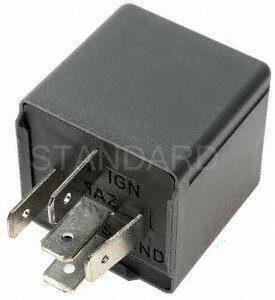 Dimensions:2 L x 1.2 W x 1.2 H - please check to make sure size is compatible, as this flasher relay may be larger than its original counterpart. Note Please make sure the 3-pin configuration is the same as your vehicle's. You can usually find your flasher pin out printed right on your flasher. Failure to check this and installation in an incompatible vehicle can blow your fuse .